These Sorbus® Beverage Stakes are a clever way to keep your drinks secure and within reach when relaxing or entertaining outdoors. When tables are not an option, these stakes are extremely convenient and portable. They work great in the yard next to the hammock, as a drink holder, for sand at the beach, and provide convenience when entertaining family and friends. Your guests can even enjoy these sturdy stakes during backyard barbeque games such as corn hole and horse shoes. Going camping? No problem, take these along and conveniently place your beverages around the fire pit and enjoy the campfire fun. Attending an outdoor concert or festival? Enjoy the music without spilling drinks on the ground or yourself while you revel in the rhythm. Drinks down, hands up! Need portable heavy duty holders to hold a variety of beverages? 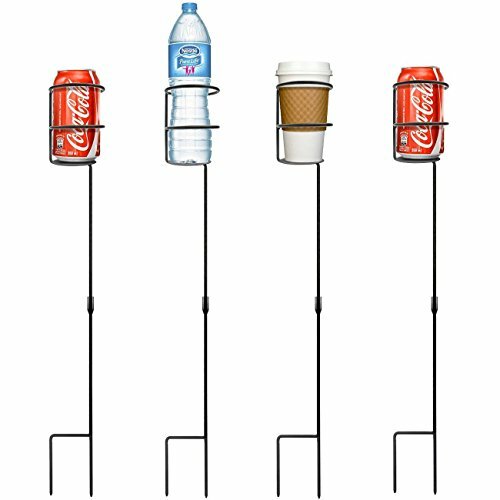 Beverage Stakes comfortably fit and support a variety of beverages including water bottles, beer cans, bottles, wine glasses, and soda cans. With an attractive and sturdy design, stakes are pointed to penetrate the ground with the ease of a foot-press U shaped bottom. Simply push it in the ground, as deep as you prefer, and insert your beverage of choice. You can easily pull them out of the ground if you need to re-locate the fun! These beverage holders are also kid friendly and the perfect solution to protect drinks from being spilled during parties and activities. The cup holder ring securely holds your beverage while the raised stakes prevents stumbling, tipping, and spilling. Made of solid welded steel construction with a durable powder coat finish that is resistant to rust and should not chip or scratch. Minimal assembly required. Measures 4.25" D x 32.5" H. Package includes four holders, in black. What are you waiting for? Create instant convenience for your backyard beverages and outdoor activities!